The issue was not in this piece of code, so my fix is in the question itself. It might still be useful for others! proNameLbl.text = "This is your text"
I've just put this in a playground and it works for me. I am a little hesitant to create a new UILabel per sizing; if this method is used inside layoutSubviews with the tendency to be invoked multiple times per complete layout, the extra object creation may introduce noticeable delays, especially during scrolling. I am unable to call this function in my view controller...Can you suggest me what could be the possible reason? this will not working as I expected I want the label size equal to my view and height be dynamic depend on text and label be at the bottom of the view how can I do that ? Instead of calculating the text/label height, I just resize the label after inserting the (dynamic) text. Blockquote NSParagraphStyle.LineBreakMode, apply to entire paragraphs, not words within paragraphs.This property is in effect both during normal drawing and in cases where the font size must be reduced to fit the label’s text in its bounding box. This property is set to byTruncatingTail by default. Code-only answers are not considered good practice. Please consider adding some explanations on how your answer addresses the question. If you are using AutoLayout, you can adjust UILabel height by config UI only. And if the label is inside a cell. When and how would you increase the cell height accordingly? This worked perfectly for me! Setup the constraints, and it will work properly! not working for me...the word "Label" in a UILabel makes height=20. It remains 20 after this setting. I have strong working solution. @Jacob, I have updated the code, check with this. Following on @Anorak answer, i added this extension to String and sent an inset as a parameter, because a lot of times you will need a padding to your text. Anyway, maybe some you will find this usefull. label.lineBreakMode = NSLineBreakMode.ByWordWrapping this line helped me thanks. Here is how to calculate the text height in Swift. 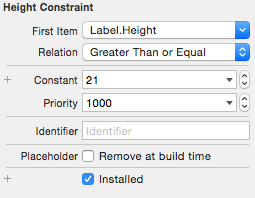 You can then get the height from the rect and set the constraint height of the label or textView, etc. let font = UIFont(name: "HelveticaNeue", size: 25)! let text = "This is some really long text just to test how it works for calculating heights in swift of string sizes. What if I add a couple lines of text?" Cannot assign to property: 'height' is a get-only property. self.font =  UIFont(name: self.font.fontName, size: sizeFont)! The label automatically adjusts its height based upon the amount of text entered. This does not make the UILabel to adjust it's height.